"Best Recurring Character - Male"
"Best Recurring Character - Female"
3rd Place) The Dandy Warhols Perform "
"Best Performance From A Guest Star"
"Best Writing By A Castmember"
1110 didn't win worst episode? Blasphemy!! All of those sketches appeared in 1110, not 1111. How dare you weinies give Arden worst castmember! I actually liked Fart Camp. Man I'd rather see no "worst castmember" category than see poor Arden get it. And also I would have NEEEEEEVVVVVVVVEEEERRRRRR expected the Patricia Arquette one to win or tie. I'm honestly shocked, but it was really good so hooray for the tie. I wanted James Blunt's video to win too. The dukes and R.Kelly ones weren't even in the top three to me but oh well. Oh yes and ****in' right baby Joey wins! Thats awesome, good call forum. You might be smarter than I thought Its cool that Ka-son won too, it shows that us fans love the featured players. But Nicole RJ beating Frank... I dunno about that one. And I hate to be a pest but will amount of votes per nominee be revealed this year? I dunno if they were last year. That might have been the forum member ones. I've seen maybe three sketches from this season, but hey: Crista didn't make it to best looking female list? I cannot believe "Best Show Open" was 'Nicole's Teenage Years.' Bleh. Anyway, thanks for all that effort/time Dartanian. I think Bobby Lee deserved the worst castmember award...Arden's made me laugh WAY more than Him.. poor arden. I'm suprised so many people found Fox NFL Sunday to be worse than that George Clooney DVD "sketch." And I don't know if I'm suprised that Stuart didn't even make the top character sketch. I think I'm relieved. Well OF COURSE Fox NFL Sunday was better than that...I mean, it may not have been FUNNY...but damn...I have to admit, that sketch gave me a...ahem...'chubby'. And like I've said before...Arden got "worst castmember" because she's basically the new Christina Moore, and aside from a few alright impressions and (possibly) the Jazzy Girls (which I didn't really like), she never really 'proved herself' to me last season IMO. Who knows? By this time next year, I'll probably really like Arden. I refuse to change anything now. Just pretend they all says #1110. Also, $0.2 to anyone who can identify the other glaringly obvious (but intentional) error (that I also refuse to change). It was only the opinions of about 10 people on a fan forum, I'm sure she'll get over it. Besides, it hasn't cost her a place in the cast or anything. This time next year, we'll have a new batch of castmembers to hate on, and Arden-suckitude will be nothing but a distant memory ... or not. Wasn't. Even. Close. Sorry TJ and Frank (if you're reading this). We just got a list last year, so CONSIDER YOURSELVES LUCKY. I'm not gonna post the individual votes that each nominee got, but I'll give you a hint: The ones with pictures got more than the ones without pictures. Okay, okay. 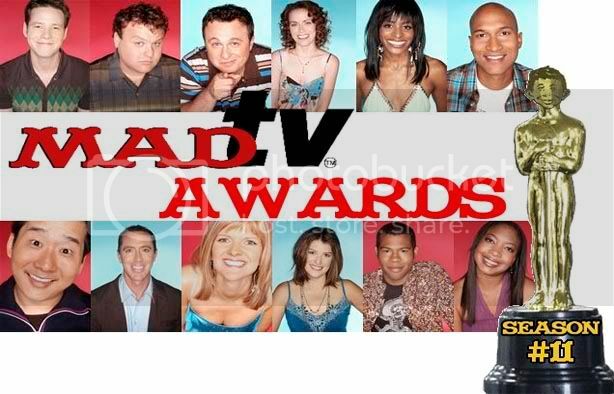 Most of the categories were landslide victories, with the exception of the episode results, show open, music video, movie parody, a guest star. Bumping for anyone who didn't see it the first time. Worst Castmember - None of them should be on the list. but it's just my toughts. Keep in mind that this ended about five months ago. Bobby Lee didn't improve he is still the same as he was when he joined the show. I'm not a fan of his.